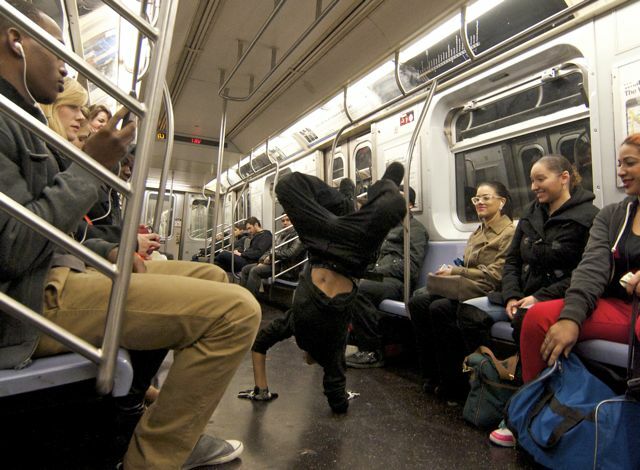 As I approached the L Train the other day, I saw some kids doing acrobatic routines in one of the cars. I got on the car behind theirs, hoping they would head that way. Sometimes I resent performers forcing themselves on captive audiences, but I was in the mood for some entertainment. Sure enough, the troupe entered my car and launched into its routine. 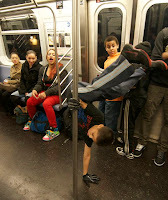 The kids quickly won over the riders with their moves and high spirits. It was fun, but nothing I hadn't seen before until a female passenger good-naturedly challenged one of them to do a handstand against the pole. He readily complied, but she claimed she could do better. When the kid and his buddy strongly expressed their doubt, she confidently proclaimed, "Of course I can, I'm a stripper!" The boys gaped bug-eyed as she got out of her seat and skillfully backed up her boast, capping off the unbilled cameo with a nice version of the worm. She smilingly tipped the kids as she left the train, though it wouldn't surprise me if they appreciated the encounter more than the money.